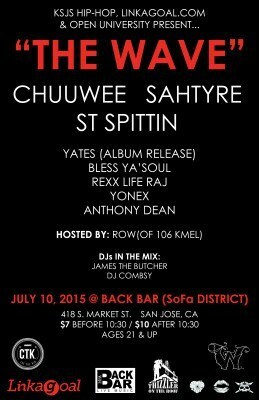 We are very proud to present our first KSJS Urban music showcase on July 10th at Back Bar (SoFa District) in San Jose. The show features Chuuwee, Sahtyre, ST Spittin as headliners as well as San Jose’s very own Yates celebrating the release of his debut project, Good Intent. The line-up also features talented artists Rexx Life Raj out of Berkley, CA and San Jose’s very own Bless Ya’Soul, Yonex & Anthony Dean. KSJS Hip-Hop has teamed up with some factors to bring you an all-star line-up for the first edition. Our goal is to bring acts that we play on the radio to the live performance arena and provide a platform for Bay Area artists to perform in San Jose in a non-Top40 environment. This edition features not only Bay Area artists but Chuuwee out of Sacramento and Sahtyre out of Los Angeles. Come hang out with all your favorite KSJS Urban DJs on July 10th, Friday in Downtown San Jose. Chuuwee – One of Sacramento’s dopest artists, Chuuwee has dropped several projects consistently for several years now. KSJS has been playing his music since 2011, and he has quickly become a household name among our circles. His latest project The South Sac Mack is produced entirely by JR & Ph7 and is available now: https://itunes.apple.com/us/album/the-south-sac-mack/id967018521 . The South Sac Mack was selected by Complex as one of the top 50 albums of the year so far. “Meanwhile off Mack”, “Meadowview Morning” and “Florin Light Rail” have all been listener favorites on our airwaves. We brought Chuuwee out to San Jose about 3 years ago, and are excited to have him on the line-up. Sahtyre – Hailing from Los Angeles, CA. Much like Chuuwee, Sahtyre has become a favorite of ours at KSJS over the years. Dropping several quality projects and dope tracks /visuals, it is clear he is in his own lane and accumulating fans as his sound grows. His latest project, LSD: Saga is his best work yet, and includes “Prince Thunder”, “Base” , “Forgive Me” & “Skeletons” which all were listener favorites in our rotation. LSD: Saga on iTunes : https://itunes.apple.com/us/album/lsd-saga/id987003865 . Yates has been putting a lot of work with his crew Westacy Ent. He will be celebrating the release of his debut solo project, Good Intent. However he is no stranger to the independent music grind, having already released a project with Ziggy by the name of Gas Crew a few years back, and appeared on several popular tracks off Ziggy and RJxV projects. Westacy is known for consistently dropping solid music and visuals, while also putting on great live shows. We are excited to have Yates out for a solo set on our first showcase. Bless Ya’Soul is another great performer from our own backyard here in San Jose. Having performed at several of our shows at Agenda Lounge and Johnny V’s (Trap Shop) in the past. He always brings the energy to the live performance realm, and has an arsenal of dope music to go with it. Along with First Class cohort, G.I.F.T., he has been in rotation several times with tracks such as “Let Me Ride” & “Vision Clear”, while also having a solo track in rotation earlier this year in “Cards Dealt”. His track with Yates and RJxV, “Pure” hit #1 on our top 40 last week. We are excited to have Bless Ya’Soul bring another dope set to our live shows. Rexx Life Raj has had a hell of a last 2 years. He recently released The Escape which boasts features from Iamsu, City Shawn, RBC Bugzy, Symba & more. But more importanty the project has a unique sound and cohesive vibes which give the feel that Raj has successfully created his own lane and brings something intriguing to the table. His track, “Sincerely Annie” is already a hit on our airwaves. We are excited to have him performing in San Jose again. Yonex has been putting in much work pushing his brand and the entire #Tankshit movement. His album Speed City is available on July 20th and produced entirely by BeatsByFly. We are excited to have him on the showcase. Anthony Dean has quickly become a favorite of ours at KSJS Urban. His track “Outta Space” hit #1 last month on our charts, and his follow-up “Koolin” drops tomorrow. We are excited to have him on the showcase as he is a SJSU student, and an artist we see having a bright future.